Online aggregator for payments Paytm on Monday announced garnering of around three million users in the first two days of 'Paytm Inbox' launch. Over 15 million messages were exchanged with about 40 percent of overall traffic coming from smaller cities and towns. "Messaging is a core feature of any transaction. 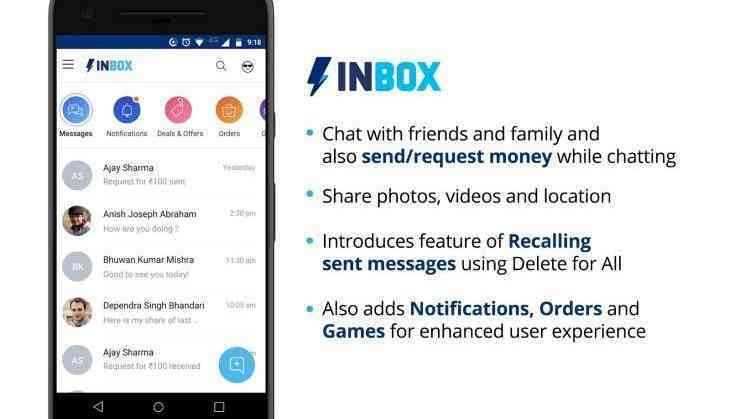 With Inbox, we have added a new dimension to payments and sending money, whether it be among friends and family or be it between a consumer and a merchant," said sr. vice president Paytm, Deepak Abbot. "In the offline world, making a payment is a part of an experience of commerce and the addition of messaging brings us one step closer to these experiential payments," he added. Small businesses in the country are expected to see huge boost in sales as consumers have started using Paytm Inbox to interact with their local shopkeepers and micro entrepreneurs to place orders and pay at one-go. This trend is likely to grow actively in the coming months with more consumers and merchants joining the Paytm ecosystem for greater convenience of interacting and transacting digitally. Apart from the messaging service, Paytm Inbox also includes notifications, orders, and games. Under 'Notifications', users can see all cashback offers available across all categories; under 'Orders', they can view their order and transaction updates; and 'Games' will have engaging cricket and trivia-based games. This complements Paytm Inbox, which combines the power of social messaging and payments to drive deeper engagement. The company witnessed over 150 million P2P (peer-to-peer) transactions over the last quarter. With Lifafa and Inbox, the company's money transfer use-case is expected to grow faster in the coming months.